The Porsche 908/3 is, without a doubt, a special car. Designed by Porsche especially for use on just two tracks in the World Sportscar Championship in 1970 and 1971 — the Targa Florio and the Nürburgring Nordschleife — its lightweight construction was radical, but boasted almost perfect weight distribution. The 908/3 distils all of the Zuffenhausen factory’s cornering expertise in a single racing car. Racing drivers have nerves of steel and a natural confidence. However, in 1969, the nerves and confidence of Porsche’s factory drivers were tested to their limits. They had the 917 which, with its new 12-cylinder, 600 hp engine, was more powerful than any Porsche that had come before it. Thanks to its streamlined body, the car was faster, too – but without downforce, this beast was virtually impossible to tame. Enter the 908/3, the hero of our story: a small, fast prototype developed by project manager Manfred Bantle on the basis of his 1968 909 hillclimber. The secret to the “mark three” was positioning the differential behind the transmission, as in the 909, forcing the gearbox, engine and driver’s seat further forwards. The axle load was split in a ratio of 45:55 front to rear, which was a much more even split than could be achieved in the previous year’s 908 or in the 917. Not that there was much weight to split: Head of development Ferdinand Piëch was merciless in his efforts to shave off the grams. The plan to defend the title in the 1970 World Sportscar Championship involved a two-pronged attack: Deploying the 917 on the fast circuits and the 908/3 on the corner-heavy tracks, the Targa Florio in Sicily and the 1,000 kilometre race at the Nürburgring. But there was a flaw in the plan: “The drivers weren’t happy. Brian Redman, Jo Siffert and later Richard Attwood too, all complained about having to sit too far forward, which stopped them getting a feel for the car”, recalled Manfred Bantle in August 2016 with regard to the situation in late 1969, which was when the factory drivers first had the opportunity to put the 908/3 through its paces. The racing prototype quickly earned the nickname of the “VW bus” among drivers and mechanics, due to the driver’s frontal, upright sitting position. In reality, the driver was seated just behind the front axle, with the pedals and his feet right at the front of the car. The front of the 908/3 drops off steeply, with a 30-centimetre overhang in front of the front wheels. From the driver’s seat, it looks like there’s no car up front at all. “But then”, continues Bantle, “they saw that they had achieved decent lap times. And as is always the case with racing drivers, they rethink their position when they look at the stopwatch. Suddenly, the seat position was no longer an issue”. On the other side of the table, Porsche was unrelenting in its insistence on a lightweight construction. Bantle: “Ferdinand Piëch was not prepared to compromise on weight. His standard response at the time was simply: ‘too heavy’. Our mission was to somehow transfer the exceptionally lightweight construction of a hillclimber, which weighed less than 400 kilograms, to a long-distance racing car. That car had to be able to withstand 1,000 kilometres of racing on the Nordschleife as opposed to 20 kilometres of hillclimbing. We worked systematically and meticulously, replacing steel with titanium, aluminium or magnesium. We reduced the thicknesses of materials wherever possible. The aluminium tube frame weighed in at just over 30 kilograms, while the body itself weighed twelve. We reduced the steel content in the chassis – not counting the brake discs – to 2.9 percent. We even removed the screws from the rear lights and glued the lenses in place”. In 1970, in fully track-ready condition, the 908/3 weighed in at 545 kilograms; a year later, a solid roll-over bar and larger rear wheels added a further 20 kilograms. Two of Bantle’s colleagues designed an exterior for the 908/3 that appears to be made from a single cast piece, reminiscent of open top racing cars such as the 908/02 Flunder or the 917 CanAm Spyder. 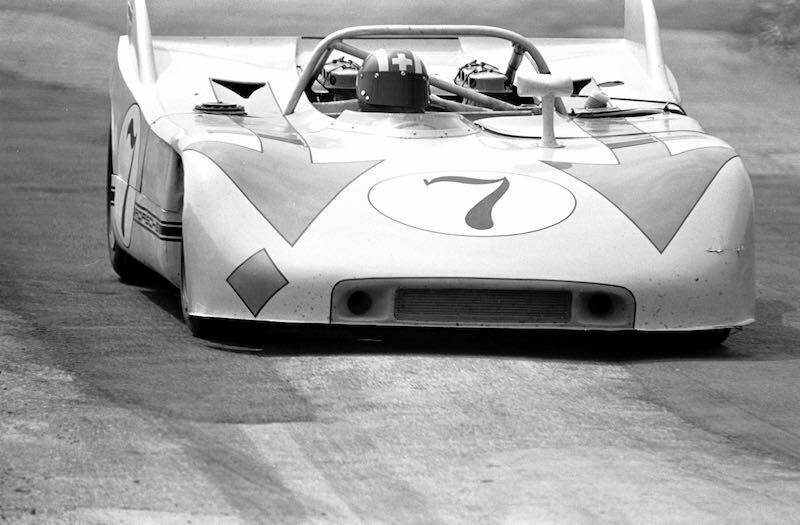 Peter Falk, head of testing and racing at the time, recalls: “At the end of 1969, my colleague Hermann Burst was working on a series of wind tunnel tests on the 917 CanAm Spyder and was involved in the development of the mark three. The final design for the body was created by Eugen Kolb in the design team.” The result must have pleased Ferdinand Piëch – because there was no trace of a spoiler on the final 908/3. Bantle: “Piëch really did not like spoilers. He always wanted them positioned two centimetres lower. The testing team and racing drivers raised them just a little bit in secret. But in the 908/3, Burst had managed to achieve a good level of downforce without a spoiler. The vertical front section, which had a small flap cut into it, worked exceptionally well, helping to prevent air pockets forming under the car. The front wheel housings were also critical; they had to allow enough air through for the brakes while minimising the effect on lift force. 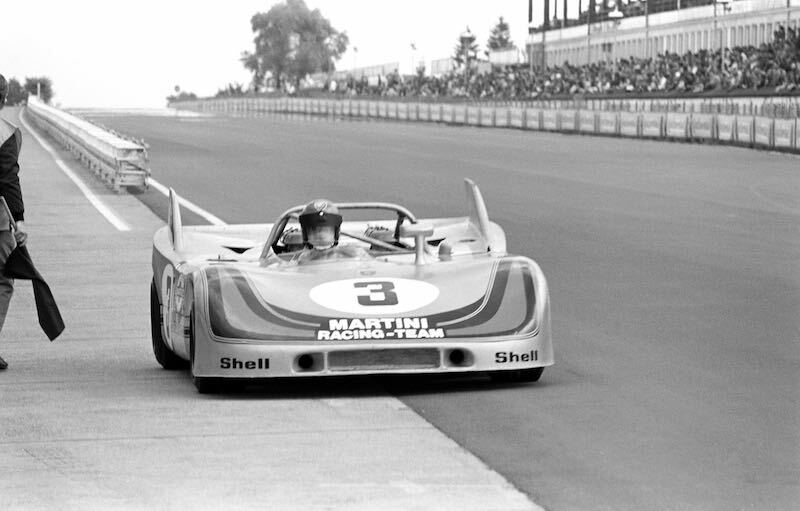 I believe we managed to very effectively limit – or perhaps even eliminate – lift at the front of the car.” It was only in 1971, the second year of racing for the 908/3, that wings were added to the body. More specifically, the new additions were comprised of shark fins on the rear end, which – as factory driver Vic Elford reported – significantly reduced air resistance and boosted engine capacity by 200 rpm, even on short straights. As planned, the factory only used the 908/3 during the Targa Florio and the 1,000-kilometre race on the Nürburgring. But who exactly was behind “the factory”? The registration list for 1970 names “JW Automotive Engineering” (JWA) and “Porsche Salzburg Konstruktionen”, and JWA and “Martini Racing” a year later in 1971. Race manager at the time, Peter Falk, explains: “Officially, Piëch wanted to keep capacity aside to develop the 917. But we knew from experience that he liked to keep us on our toes with a bit of internal competition. JWA was John Wyer’s team, which had beaten us in 1969 at Le Mans and said that we could never win there. ‘Porsche Salzburg’ was actually just the factory team, and there were plenty of familiar faces from Zuffenhausen with Martini Racing in 1971 too. This had special relevance for the 908/3. Wyer’s people weren’t familiar with the car, so our mechanics and engineers at the Targa and the Nürburgring assisted during the race on behalf of JWA. We helped in a similar way, although to a lesser degree, in 1971 when the 908/3 was raced by Martini”. At the end of April 1970, the Porsche convoy departed from Zuffenhausen and headed for Sicily. The trucks carried five 908/3s and a 917 Kurzheck. Bantle: “Piëch wanted to be absolutely certain: Could the powerful 917 compete with the manoeuvrable 03?” Falk recalls: “The car was too large and too wide for the Targa; it couldn’t transfer that power to the ground. While the 908/3 was slim and quick, the 917 was as clumsy as an elephant. It simply couldn’t win”. After training, the 917 was severely damaged in a collision with a truck on the way back to the Porsche headquarters. But the drivers had already made up their minds: They were taking the mark three. 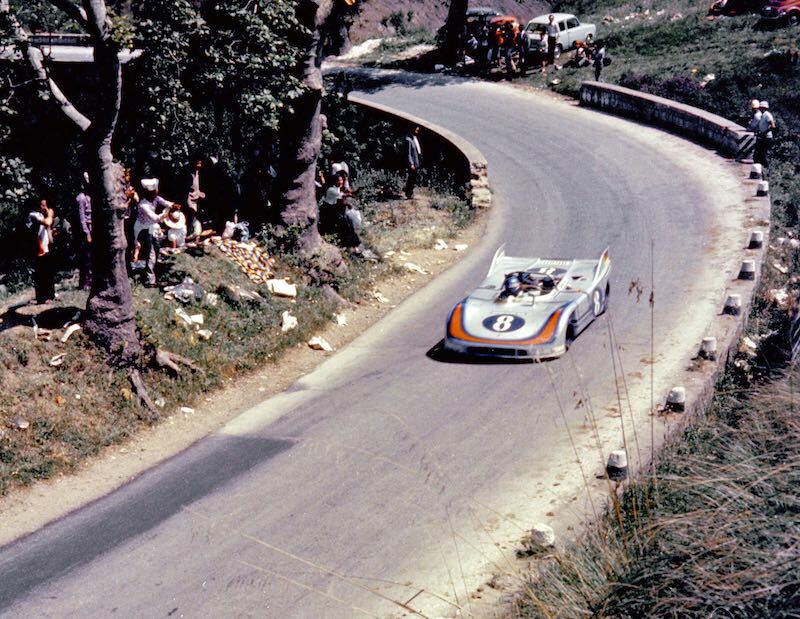 On May 3, 1970, the day had come: the 54th Targa Florio, the fifth race of the world championship on closed mountain roads in the north of Sicily. Eleven laps of the 71.9-kilometre Piccolo Circuito delle Madonie, with 700 to 900 corners to tackle on each round. The exact number depends on who you ask – but the 600-metre height difference and six-kilometre long straight down to the sea are undisputed features of the circuit. Jo Siffert/Brian Redman, Leo Kinnunen/Pedro Rodríguez and Richard Attwood/Björn Waldegård take the wheel in the light-blue and orange Porsche for the JWA team, while Vic Elford/Hans Herrmann drive a 908/3 in the red and white livery of Porsche Salzburg. The main competition comes from the factory Ferrari 512S, driven by local heroes Nino Vaccarella and Ignazio Giunti, whose 550 hp, twelve-cylinder car sparks mass hysteria on the sidelines among Sicilian natives each time it roars past. Siffert achieves the fastest training time, with Elford in second place, and Vaccarella 36 seconds behind in third. His Ferrari is 200 hp more powerful than the diminutive Porsche, but has to drag almost 300 kilograms more weight around the mountain circuit. The Alfa Romeo T33/3s also look strong: Their V8 four-valve engines deliver significantly more power from a displacement of three litres than the dual-valve Porsche engine. But the racers from Milan – around 150 kilograms heavier than the 908/3 – just cannot compete with Porsche on weight. The start time is set for Sunday, 8 a.m. But the timekeepers are stuck in traffic, so the race starts at 9.15. The cars race off at 15-second intervals. After four laps, Kinnunen/Rodríguez are ahead of Siffert/Redman. Vaccarella/Giunti are holding on to third place. In lap six, the Ferrari heads out to the front, but both of the Italian drivers are suffering from a fever and can’t maintain the pace. Rodríguez isn’t on top form either; Kinnunen is significantly faster in the same car. In lap seven, Redman takes the lead from Vaccarella. In third place behind him, Kinnunen finds the courage to produce a record performance in the last round, coming in at 33:36.0 minutes, 40 seconds faster than the leading driver Siffert. The record remains unbeaten today. After this incredible lap, the Finn takes second place from Vaccarella and delivers the perfect double victory for the 908/3: Siffert/Redman in first, Kinnunen/Rodríguez in second and Vaccarella/Giunti in third. But what about the other two mark threes in the race? Elford crashed eight kilometres in; Attwood and Waldegård came in fifth. Skip ahead to May 31, 1970: The car’s second outing at the 1,000-kilometre race at the Nürburgring would prove pivotal. The decision between the 917 and 908/3 had already been settled. Bantle: “Siffert drove 7:48 in the mark three. This simply wasn’t achievable with the 917”. Again, there were four 908/3s on the starting grid, two representing JWA and two for Porsche Salzburg Konstruktionen. Siffert/Redman start in pole position in front of Rodríguez/Kinnunen, both in JWA cars. Elford/Kurt Ahrens and Herrmann/Attwood follow in positions three and four. The fastest 512S, driven by Giunti/Arturo Merzario, is 18 seconds slower than Siffert, and starts in position six. The race starts, and one thing quickly becomes clear: The 908/3 is unstoppable on the Nürburgring, too. Giunti retires from the race during lap three due to a fault in his car’s fuel injection system. Ahrens/Elford get ahead of Attwood/Herrmann, while Rodríguez is forced to take his Porsche out of the race when its oil pressure drops; Kinnunen is involved in an accident, ruling him out of the competition. With a double victory at the Nürburgring, Porsche is once again the world champion. The 908/3 met all expectations – and spends the winter recovering indoors. 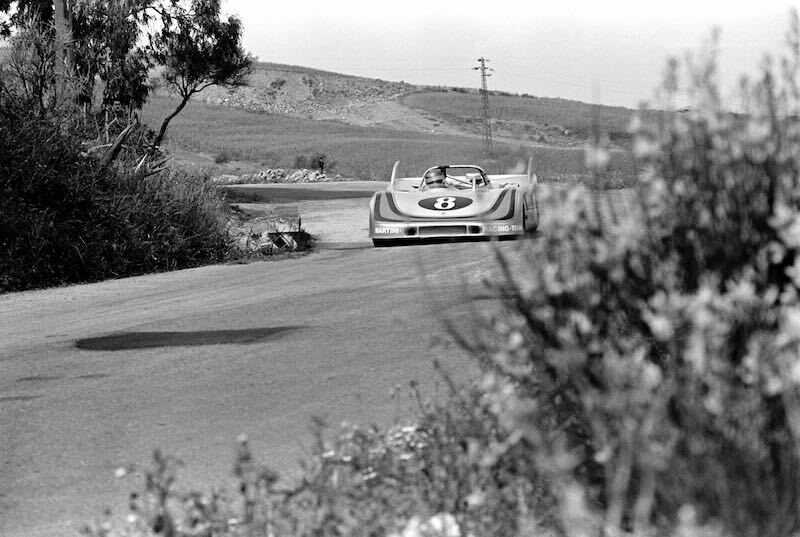 The 55th Targa Florio in 1971 soon comes around. Road races have, by now, become a controversial event, considered too dangerous by many. In an impassioned speech, the president of the Palermo Automobile Club suggests that Sicily could declare independence from the mainland to save the Targa. Herbert Müller/Rodriguez and Redman/Siffert come to Cefalù for JWA; Elford drives a 908/3 with Gérard Larrousse fo?r Martini Racing. All the 908/3s now bear shark fins and a small rear spoiler. The roll-over bar appears safer than the thin pipe structure of the previous year. The main competition comes from the factory Alfa Romeo. The new 33/TT/3 has been the subject of much discussion in the press, with reporters making comments such as: “… The best way to describe the car is as a 908/3 painted red.” The Italian journalists referred to the Alfa as the “tipo tedesco”. The second JWA Porsche also failed to progress past lap one: Accelerating out of the village of Collesano, Rodríguez destroyed both of the wheels on the left-hand-side of the car. But there was one positive: Larrousse was in the lead. A three-way battle ensued over the hundreds of kilometres remaining: two Alfa Romeos against the single remaining Porsche. Elford drove the fastest lap. By lap six, or 430 kilometres, Larrousse had amassed a lead of just over a minute, but in round seven, disaster: a flat at the rear. Larrousse pulled in, replaced the tyre, and carried on…only to suffer yet more tyre damage. The 908/3 hobbled the 30 kilometres to the pit lane, then headed back to the track. But the rear axle had suffered too much damage, and Larrousse was forced to retire in lap eight. Sicily celebrated a double victory for Alfa Romeo. The final factory race for the 908/3 was the 1,000-kilometre race at the Nürburgring on May 30, 1971. The Porsche mechanics looked pretty tired after having worked round the clock whipping the casualties of Sicily back into shape – and were still frantically screwing on the last nuts at the Nürburgring. Porsche were up against Alfa Romeo, which had spent a week testing at the track, and Ferrari. Ickx and Regazzoni in the Ferrari 312 PB in particular made life difficult for the Porsche team; they enjoyed stints in the lead until the 440 hp Formula 1 engine from Maranello overheated halfway through the race. In spite of the rigorous testing, the Alfa failed to go the distance at the intense race speed. 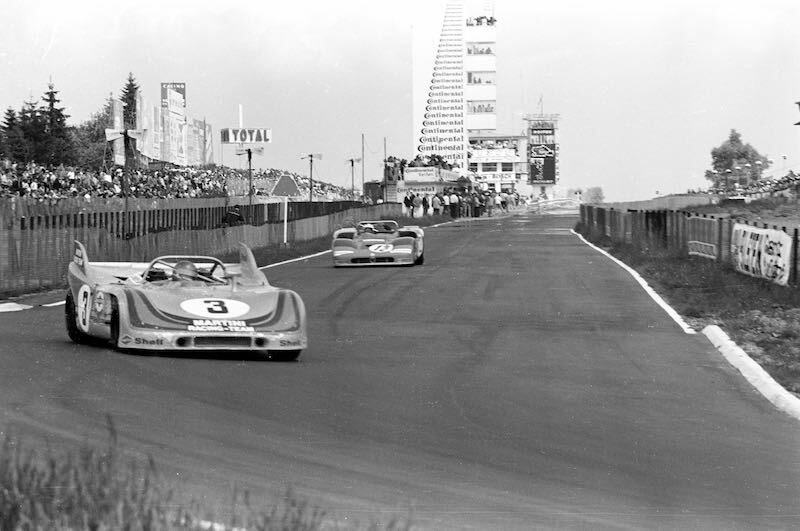 Elford and Larrousse crossed the line first in the 908/3 in silver Martini livery, with Rodríguez and Siffert in the light-blue JWA Porsche in second place. 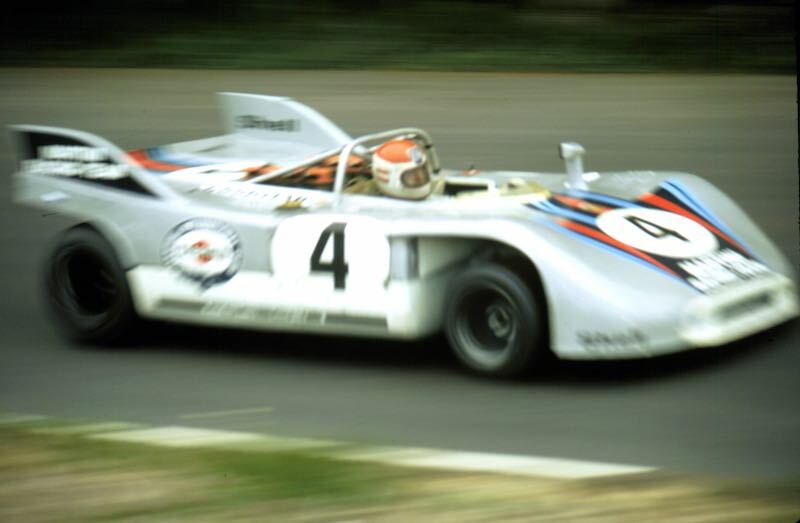 The race to second place was spectacular, with Rodríguez forced to defend his position against a determined Helmut Marko in a Martini 908/3, eventually emerging victorious by a very narrow margin. Five laps before the end of the race, the Mexican – who was suffering from a cold – slowed down significantly, so Marko saw his chance to attack. In the final lap, Marko was hot on the heels of Rodríguez, who managed to block his opponent’s path and defend his second place from being conquered by the Austrian by no more than a tenth of a second. With those final dramatic scenes, the curtain fell on the factory racing career of the 908/3. Porsche built a total of 13 908/3s. 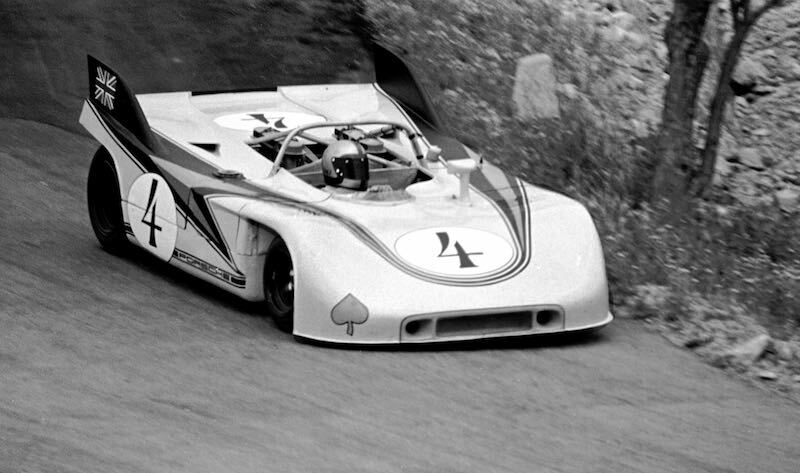 In October 1971, the first raced for a private Spanish team. In 1973, Reinhold Joest and his team achieved their first ever victory at the 9 Hours of Kyalami in a privately owned 908/3. In 1975, the first model with a turbo engine was unveiled, followed by the 03 with dual turbo in 1979. Only in 1983 was the racing career of the car – which had revealed its extraordinary potential over its long and active racing life – wrapped up once and for all.